You are currently browsing articles tagged tool. I’ve spent the past nine weeks enhancing the catalogue records for the basketry collection at MERL in preparation for trialling an online exhibition using the ‘exhibitions tool’ on our database, Adlib. Our basketry collection, comprising 637 baskets and basketmaking tools, is, like all of the collections at MERL, Designated as being of national importance. They are also national in scope, with baskets from England, Wales, Scotland and Northern Ireland. The basketry collection is one of our most popular and most visited collections at MERL. While we hold quite a lot of information about the collection, very little of it was available on Adlib… until now! In the 1960s Dorothy Wright, author of ‘The Complete Book of Baskets and Basketry’ and an authority on all things basket-related, studied the collection and completed detailed ‘Catalogue of baskets’ forms. She also played an important role in acquiring baskets for the Museum. Emily Mullins Collection – Emily Mullins was a Reading basketmaker who gave about 200 baskets and tools to the Museum, making baskets specifically for MERL and donating the contents of her workshop. British Council Collection – these baskets toured Australia and New Zealand in the early 1950s as examples of traditional British craftsmanship. 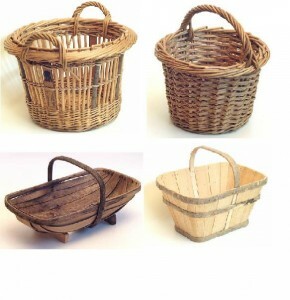 A MERL 'Catalogue of baskets' form completed by Dorothy Wright. 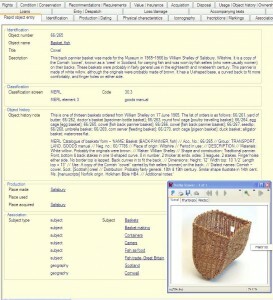 Description: information for the non-specialist – a description of the shape of the basket, what it is made from, what it was used for, who used it, dialect names etc. 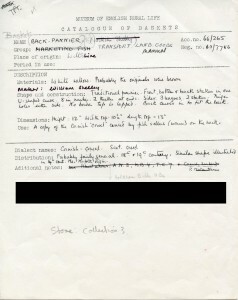 Scan of the MERL ‘Catalogue of baskets’ form: information for the specialist – this includes additional information about material, construction technique, dimensions, distribution, sources of reference. It also shows numerous crossings out and amendments which may be of interest to the specialist. The 'Rapid Object Entry' screen for a fully enhanced basket record. I spent a very long time thinking about how to name the baskets and tools in a simple and searchable way. I think Felicity must be fed up of hearing me talk about object names for baskets! In fact, we could easily write a long post on the trials of naming objects! We consulted SPECTRUM, the standard for museum cataloguing, for guidance on object names, confirming that an object can have multiple names, and for guidance on the use of titles. In terms of searchability, we had to consider what ways and terms people will use to search the catalogue and whether the object name will bring up the desired results. In terms of simplicity, we had to consider the variety of object names used and whether we wanted an infinite number or a restricted number (as Ollie envisages eventually having a drop down list of object names for the whole Museum). Tools were fairly easy to name and each was given two names – the name of the tool (e.g. Bodkin; Needle; Chisel; Shave; Cleave) and the name ‘Tool, basketry’. The baskets themselves were more challenging. We looked at various ways of naming them – the detailed names given by Dorothy Wright, names based on the content (e.g. Basket, herring), the process they were used in (e.g. Basket, fishing), the accepted name (e.g. Basket, herring cran) etc. Eventually we opted mainly for a simplified content-based approach (e.g. Basket, fish; Basket, animal; Basket, fruit) with some exceptions (e.g. Basket, shopping; Basket, bicycle; Basket, gardening). For objects that aren’t specifically ‘baskets’ (as in vessels for containing things) they were given two object names (e.g. Basket, chair and Basketwork; Trap, eel and Basketwork). Commonly accepted names such as ‘Devon splint basket’, ‘trug’ and ‘kishie’ were added as Titles. Hopefully, any further information is captured in the description. But my work with the baskets isn’t over yet – there are still some baskets which need accessioning and then I need to experiment with the exhibitions tool and look at putting together an online exhibition. Top left: 63/602 'Basket, fish' - Quarter cran herring basket. Top right: 65/205 'Basket, fruit' - Kentish kibsey. Bottom left: 77/321 'Basket, gardening' - Trug. Bottom right: 91/38 'Basket, potato' 'Basket, feeding' - Devon splint.